k!) BookBairn had her visits to school nursery and finally went for a trip on the little train at our local country park which we have been trying to get her to do for ages! The Wee Page Turner has grown in confidence to explore soft plays, climb the stairs on the slide at the park, mastered walking with the aid of a walker and can stand all by himself (admittedly only for a few seconds but he can balance!). 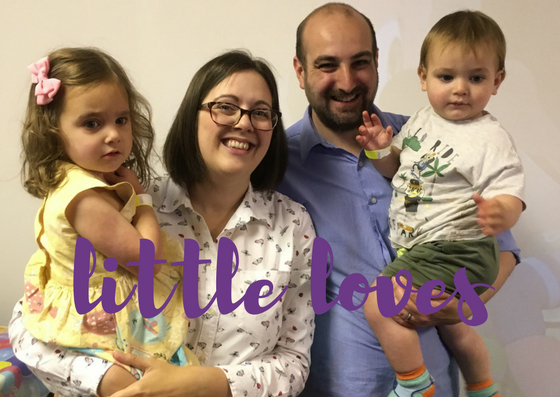 So those are the challenges we have overcome this month and here are some of the little loves we have been enjoying. 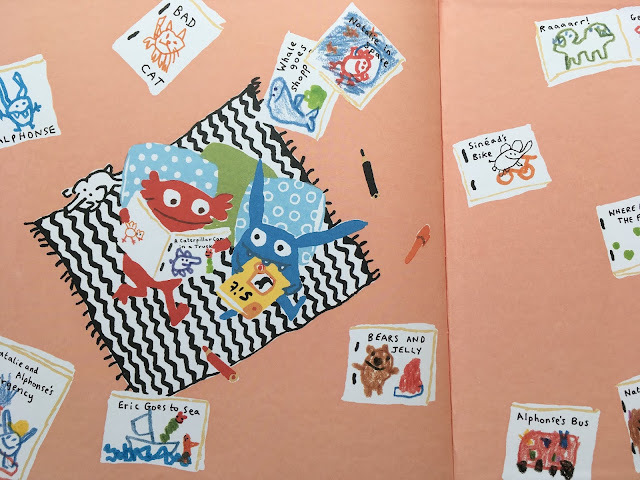 The book we have read most often this month with BookBairn is 'How to Be a Lion' by Ed Vere, which is published today, but as we got a sneak peek from the publisher we've had several weeks to enjoy this story already. Leonard is a lion like no other: he's sensitive, gentle and writes poetry in his spare time. And he befriends a mouse. When the other lions hear about his un-lionyness they challenge him and tell him there's only one way to be a lion. Leonard, with the help of his duck friend Marianne, uses the power of words to show them that there's no one way to be. Celebrating individuality and the power of words this new fable is truly captivating! BookBairn has always loved lions so there's no doubt that's partly why she has fallen for Leonard, but it's also a beautiful story packed full of vibrant artwork that has utterly charmed her. Look out for this one in the Touring Picture Book Club in August with a giveaway too. The Wee Page Turner has also been drawn towards a yellow cover. 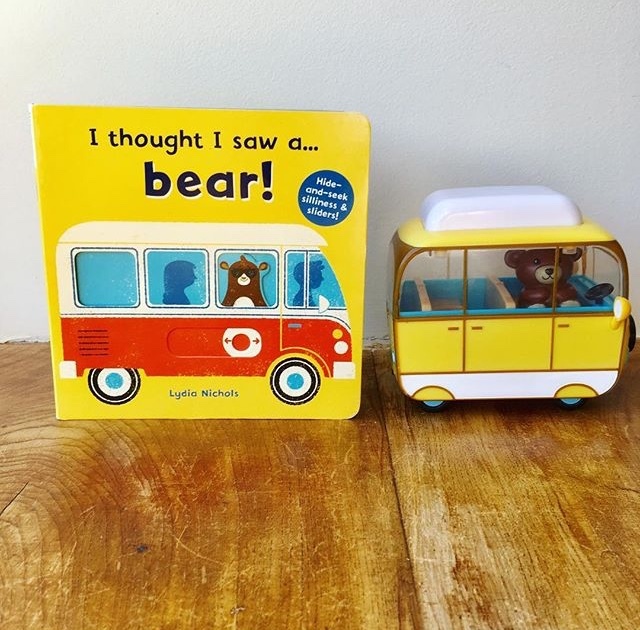 'I Thought I Saw a Bear' by Lydia Nichols has been pulled out of his book basket time and time again! As with the others in the series, each page repeats the phrase “I thought I saw a ...” and then using the slider you can reveal the creature. He particularly loves when the bear slides on the cover and when he pops up in the car. This book has a transport theme with bear popping up in lots of different vehicles and modes of transport so it's perfect for adding in lots of transport vocabulary too. We’ve been acting our parts of this storing using some of our toys too which makes him giggle! 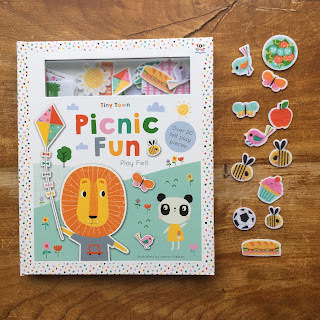 These are very simple, very clever little books that are great for entertaining little readers and perfect for popping in your bag for out and about stories. After having a 'meh' reading month in May with very few books that I found exciting, June has been a month full of captivating stories for me and I'm struggling to choose a favourite! I read two Agatha Christie books that I really enjoyed but I think the book that most surprised me that I loved was 'Gather the Daughters' by Jennie Melamed. I think this surprised me partly because it's not exactly what I expected from the blurb. It's a very dark and disturbing piece of feminist dystopian fiction where the girls are forced to marry young, and in their childhood are subjected to horrific abuse by their fathers as their mothers remain silent accepting this as normal. The only reprieve comes in the summer when the children are set loose to live in the wilds only returning home to doorsteps to collect food. And at the end of one of these summers, one girl sees something she shouldn't which has them all questioning the normality of their lives on the island. Incredibly dark, harrowing and downright scarring book, this is one that will stay with me for some time and although I wouldn't say I enjoyed reading it, I found it to be an incredible book. We are huge fans of the Go Jetters, the television show on Cbeebies and were delighted to watch the newest episodes which were released at the start of this month. I really like this show as it's entertaining without being grating like a lot of kids TV and it's packed full of educational elements. Basically, the Go Jetters are specially trained superheroes/agents who travel the world visiting world monuments rescuing them from Grandmaster Glitch who has a nasty habit of glitching things. He's a loveable sort who just gets things a little wrong. BookBairn has learned so much from this show - and I think she is keen to travel to see some of the monuments in real life - she especially likes Big Ben, Tower Bridge and the Eiffel Tower (all conveniently located within short flights thank goodness). The new episodes are equally as good and our favourite has to be when they go to the Great Pacific Garbage Patch to try to unglitch the ocean of the mountains of plastic waste! There is a scene that makes both the kids laugh out loud and it's the first time I've seen The Wee Page Turner laugh at the TV. If you're tired of Peppa Pig or Paw Patrol, we highly recommend that you give the Go Jetters a try! I mentioned in last month's Little Loves post that BookBairn had recently become fascinated by Beauty and the Beast and that she really loves Princess Belle. 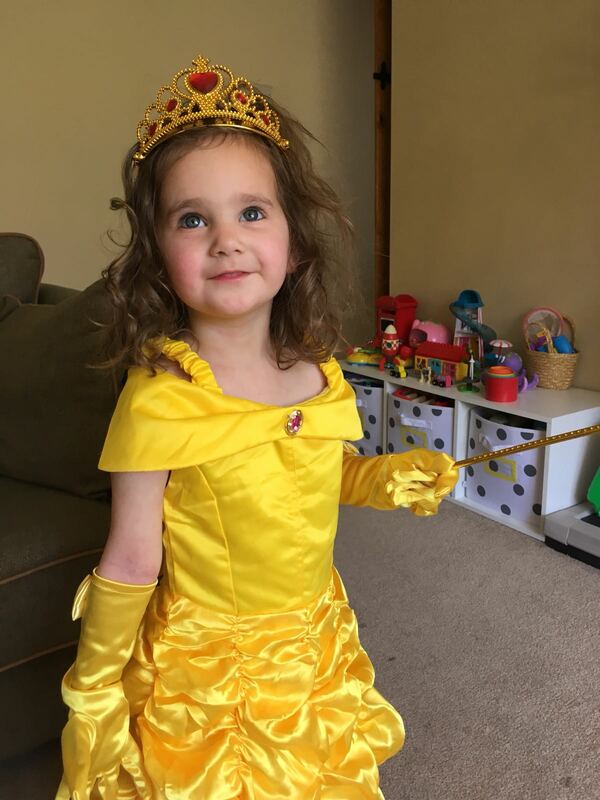 She has been asking for a Princess Belle dress since she first saw the ballroom (Tale as Old as Time) scene and I decided it was a good opportunity to teach her about saving up for things that we want. So I got her a special jar and we went to the back to get out enough £1 to buy the dress and she had to gradually earn them by being good, helping around the house as well as getting a few extras from her Papa! But she finally earned enough and when she woke up from an afternoon nap - there it was - her very own princess gown! And she loved it. I welled up with tears because she was just so happy and proud of herself. It's her favourite thing in the whole world and I think she would wear it everyday if she was allowed. She loves dancing in it, twirling in it, singing, playing piano, climbing and reading all dressed as her favourite princess. One of the things that we most enjoyed making this month was our dino footprints potato printing that we did for our latest Touring Picture Book Club blog post. It was so easy to set up and tidy up too and we did have lots of fun making stomping sounds as we printed. 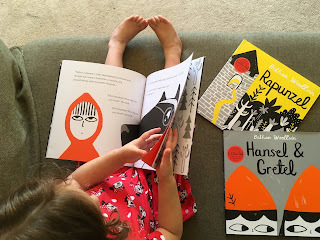 I haven't done it before with BookBairn and I will definitely try to be more creative with cutting shapes for her because it was so much fun and made a great picture for her 'portfolio' of artwork! I finally figured out how to link my phone up to play through the speakers of the car. It wasn't complicated but I finally took the five minutes it needed to get it set up. And now we can listen to our Audible and library app audiobooks through the speaker system which I am loving rather than straining to hear them properly (especially whilst the windscreen wipers are on!). We also have a 'kids playlist' using Spotify that we play daily through our Google Home speaker but I realised that I could download so we can listen to it in the car as well which is great because The Wee Page Turner isn't the happiest car traveller but he loves music so seems to keep him happier! June has been a rather strange month as it started with me being rather unable to do much at all (or it at least it felt that way) whilst I had my arm in a sling after dislocating my shoulder and I'm still trying not to overdo it on that arm as I'm terrified it will happen again and I'm still to see a physio to get the all clear. But I did have to ask for help a lot, something I'm not good at, and it made me appreciate how lucky I am to have such wonderful family and friends all of whom were so willing to help. And that made me feel humbled. So thank you friends! These blog posts are becoming my absolute favourite ones to write and I know that they will be the ones that I enjoy looking back on in the future. 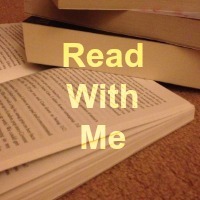 I hope you enjoy reading them too! There are loads of great books out there for babies and toddlers and since starting this blog (nearly three years ago!) I've noticed that much more attention is being paid by publishers to the design and construction of books for the littlest readers. Gone are the days of struggling to find board books that are suitable! 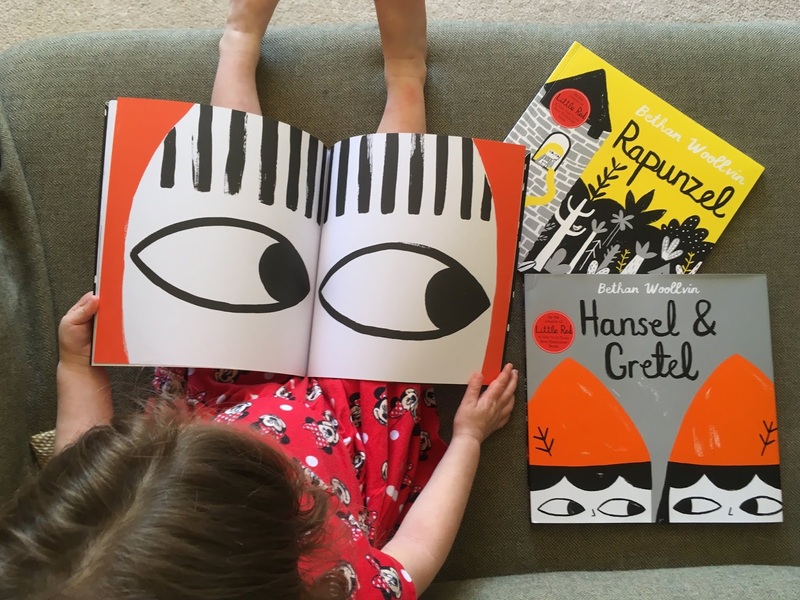 There are so many wonderful books out there to engage you little ones (and their fingers) and the variety of artwork is vast and varied. So when I saw the fantastic design work that Lemon Ribbon have put into their new series of books I was surprised to see something different. 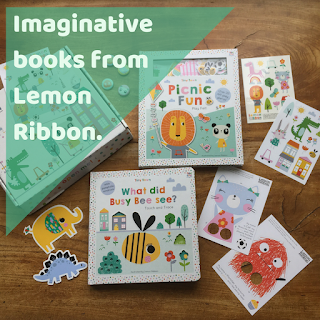 The Lemon Ribbon Tiny Town range of books feature six main characters (and you can meet them all on their website here) in a variety of different activity books and first word primers. The style of these books is truly beautiful - the colour pallette and the creation of the Tiny Town where the characters live are just so sweet. The characters are so adorable and BookBairn obviously loves the fact that there's a lion on the team! We were sent two fabulous books from the series and we love them both. 'What did Busy Bee See?' is a wonderful book full of finger trails and die-cuts for little fingers to explore. It stars a little bee and you follow it's journey across the town passing lots of interesting things along the way. There are so many things in the illustrations that you can talk about with your little one that it's a great vocabulary builder without being as basic as a word primer book. 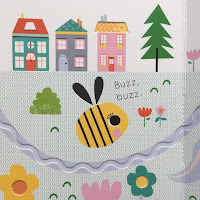 The illustrations are unlike the bright and bold designs of many books for babies using a softer colour palette instead. But the lines are still crisp and clean meaning that they still provide a high enough contrast to engage little ones when their eyesight is just developing. 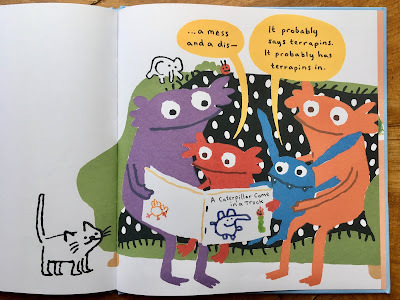 But the real joy of this book is that the finger trace elements provide a touch and feel (or touch and trace for toddlers) that little ones will enjoy exploring. This one would make a great new baby gift! 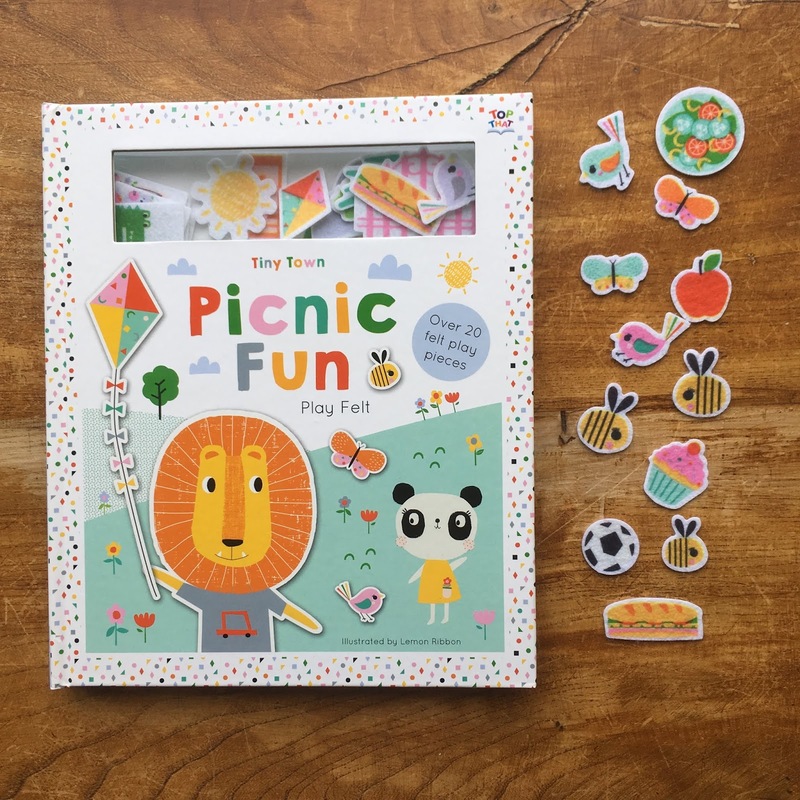 'Picnic Fun' is a book that takes me back to my childhood play with fuzzy felts. The Tiny Town friends are having a picnic at the park but their picnic won't be complete without your help. 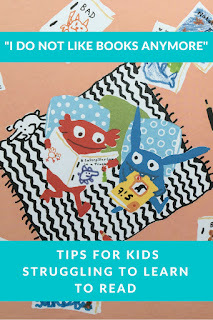 As you read the story, little ones are given instructions of where to place the fuzzy felts (though they can of course play freely with them and we like to do that too). 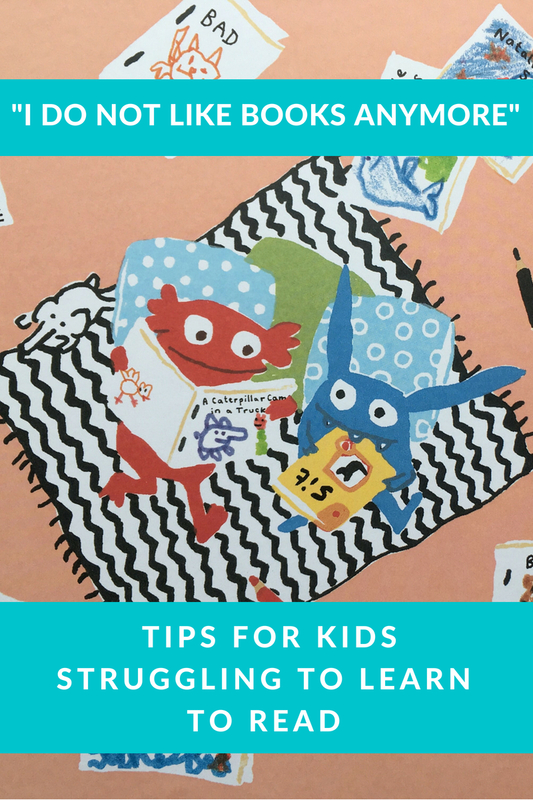 So for example, when playing hide and seek, you have to add the hiding places on top of certain creatures depending on what the story says (and of course you can change it each time you read as well to keep them on their toes). And you have to give each friend the toy they are playing with according to the story. BookBairn's favourite page is the scene with the bus as she puts all the characters on so that they can go home. Again the illustrations are a beautiful soft colour palette and are incredibly cute! The characters are simply adorable! This is a great book for popping in your bag when you're going on a car journey or for a restaurant visit as it will keep little hands busy whilst they wait! And if like BookBairn, you really fall for these characters you can visit the website to download colouring-in sheets of all the characters too! (Another great thing to pop in your bag!) I think we will pick up another in the series before we do our next holiday! 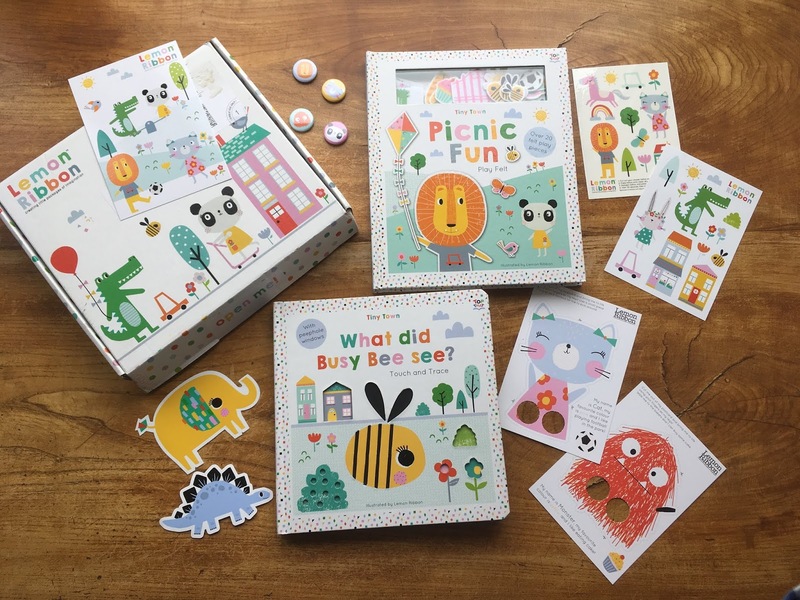 The packaging that our books were sent in says "a little package of imagination for you" which seems to me to be a perfect description of these imaginative, cute and fun books. Disclaimer: This book was sent to us by the Lemon Ribbon team for review and this blog post was sponsored by Lemon Ribbon. One of the things that I love about writing this blog is that occasionally I get prompted to look for something that I otherwise might not have come across. And the Little Feminist Book Club has been great for that as it has encouraged me to seek out books that star wonderful mighty girl characters, tell stories of real life inspirational women and books that have a feminist message. And one of the gems (or three little gems) that I have discovered are the new fairy tale retellings by Bethan Woollvin. "If you want your children to be intelligent, read them fairy tales. If you want them to be more intelligent, read them more fairy tales". But have you ever really thought about the faiy tales we tell? They have changed so much over time from word of mouth story telling to the sanitisation of the stories to the disney-fication of them. (And thank goodness for that - the originals are still way too gruesome for me even as an adult!) But really it's time for another update. One that sees the female characters as strong, intelligent and able to care for themselves that reflect our society. Don't get me wrong there's a space for all of the versions and I'm not suggesting that we delete or get rid of older versions but I think it's time we thought about the messages in these stories and taught our girls (and boys) to question them. And in fly the three wonderful retellings by Bethan Woollvin. 'Little Red' tells the story of a new Little Red one who is sharp and clever and not stupid enough to mistake a wolf in old lady's clothing for her grandma. I've always wondered how naive you would have to be to make this mistake (and clearly so did Bethan!). So this Little Red is a feisty, smart and savvy little girl who isn't fooled easily. And there are many things in the woods that "might scare some little girls. But not this little girl." I love this Little Red so much that I treated myself to one of Bethan's pins from her online shop so that I can wear her with pride! The back cover describes it as "a darkly comic, boldly original Red Riding Hood" which sums it up wonderfully. 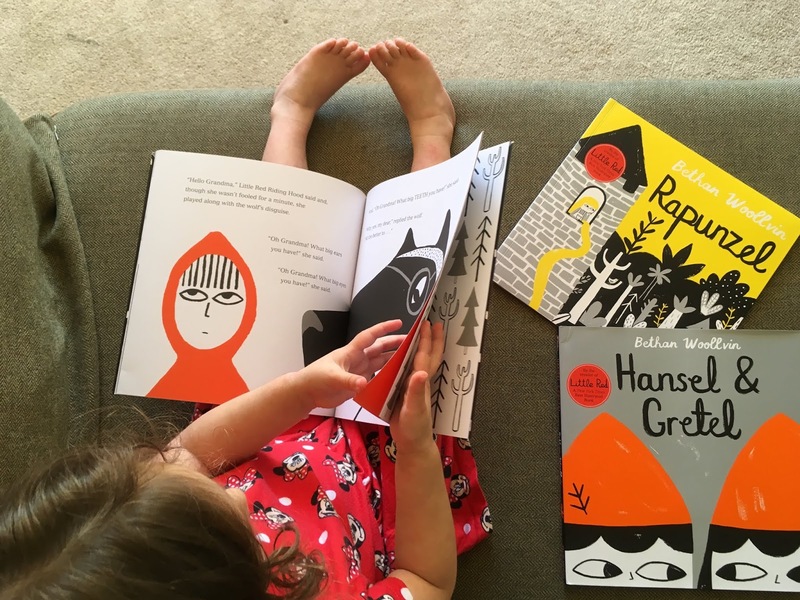 Bethan Woollvin's incredible graphic illustration style, created using lino printing I believe is incredibly stylish and cool and uses primarily three colours: black, white and red, making Little Red stand out all the more for little readers to admire. The characterisation of Little Red is expertly executed through the positioning of her eyes and you can really tell what she is thinking. In fact one page focusses on her eyes alone and it is perfect. For children who read the story using the pictures this book is witty, wonderful and just the right amount of gruesome! As is her next book in the series, 'Rapunzel' is all about being your own hero. I mean why would you let some old lady witch come and brush your hair on a daily basis, figure out a way to escape and then need some prince to come and rescue you? I mean if you've escaped once why not do it again right? And so this Rapunzel explores the woodland around her, finds a book titles how to defeat witches (from her local library presumably) and then takes that witch down, escaping and becoming a wanted witch-slayer. Again using the bold illustrative style, this time focussing on black, white and yellow, this story is funny and inspiring read. And her latest book, 'Hansel & Gretel', turns the tale of those two gingerbread-loving children on it's head. The witch, in fact, is not a nasty and manipulative woman who lures children with her gingerbread house but is actually a a good witch, who only ver uses good magic, and never gets angry. But when two children rock up at her home and start eating it, causing havoc and playing with her spells and potions, Willow's patience runs to it's limit. And when they try to shove her in the oven to keep her from stopping the chaos they have created, well that's the straw the broke the camel's back, or the deed that broke the witch's patience if you will. Again using a wicked sense of humour, and her signature bold illustrations (this time with orange! ), Bethan has created a tale that will make you cheer for the witch when she turns those cheeky children into gingerbread men! These are the sorts of fairy tale characters that I want BookBairn to read about. And by the number of times we have read these fairytales it seems that she wants to read about them too. If you are raising children to not see the world as absolutes, as black and white, these books will help you to inject a little colour into their thinking: be it red, yellow and orange (as well as many others because I hope there will be many more in this series). And they are a must have for a little feminist bookshelf. If you'd like to see the awesome pins and patches that Bethan has created to go with these stories do check out her website http://www.bethanwoollvin.com/ I'd like a Rapunzel pin to go with my Little Red. 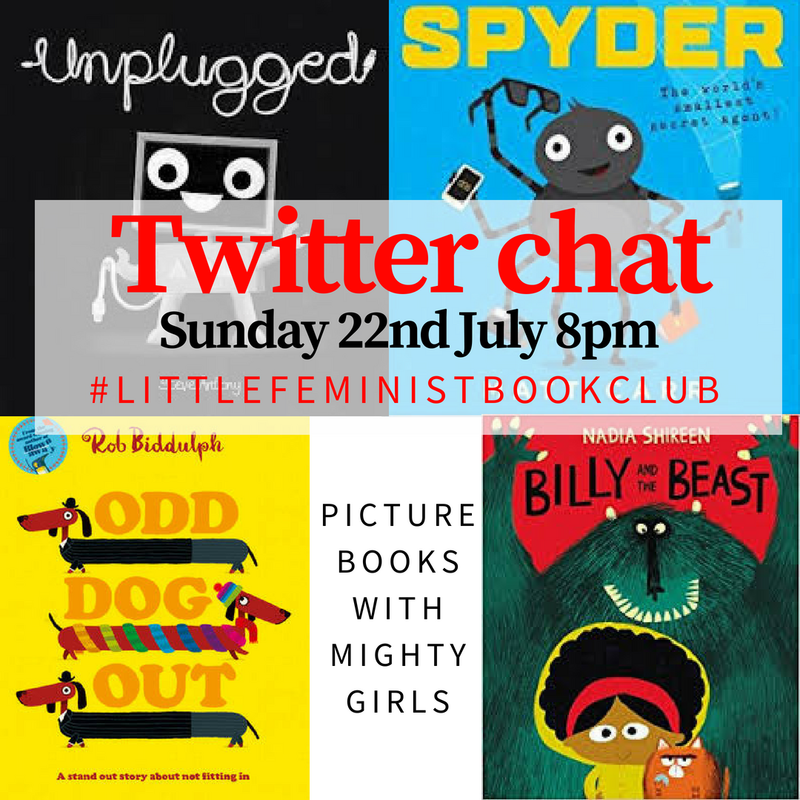 In July we will be sharing a selection of picture books that incidentally have great female characters. Books where the character could have been male but instead the authors created characters that buck the trend of male characters dominating children's literature. * Picture books with mighty girl characters such as Odd Dog Out, Spyder, Unplugged, and Billy and the Beast. 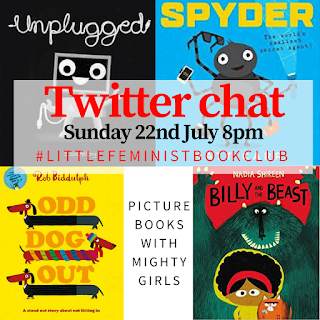 And I will be hosting a Twitter chat so that you can share all your awesome suggestions to add to the list on Sunday 22nd July at 8pm so please come along and share your favourites! 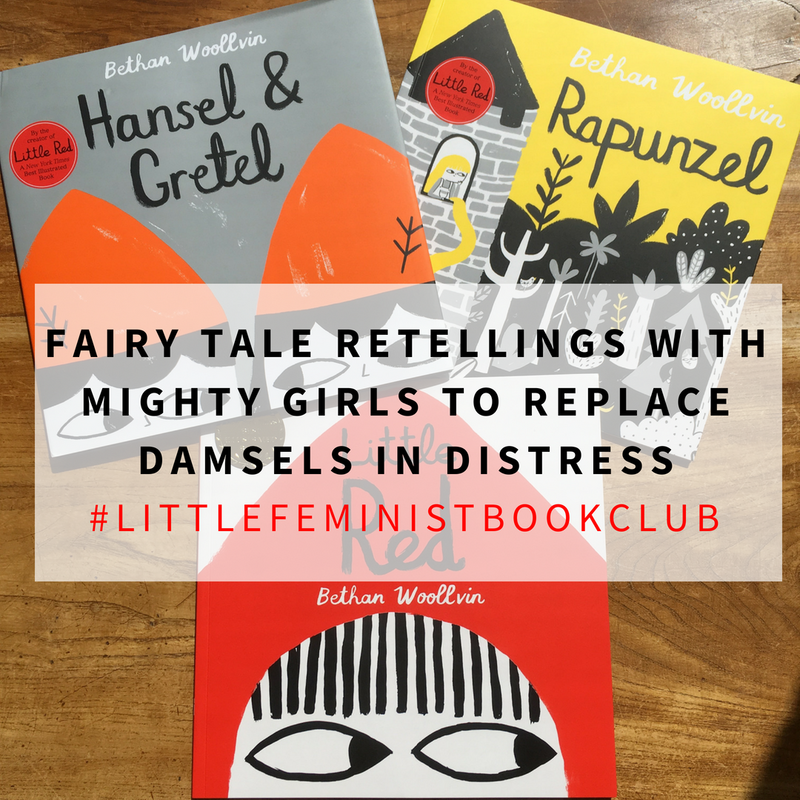 DISCLAIMER: I was sent copies of Hansel & Gretel and Rapunzel free for review from the publisher after I requested them, knowing that they would be perfect for the Little Feminist Book Club and I bought a copy of Little Red (and the pin) myself. *Male characters are twice as likely to take leading roles in children’s picture books according to recent research by the Observer newspaper. Not only that male characters were given more speaking parts, were portrayed in more masculine roles and, shockingly, in a fifth of books (of the top 100 sellers in 2017) there were no female characters at all. 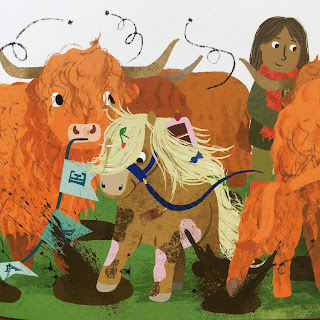 We recently went to one of our local farm shops that boasts a marvellous steak barn for a family meal out and whilst we were waiting on our food we went over the the field to take a look at the highland cows, which BookBairn sweetly renamed the 'wighland cows'. These beautiful beasts have fascinated me for a long time with their shaggy orange coats and their incredible horns, which provide a mythical element that I love. And have you ever seen a baby highland cow? They are super cute! It's one of those things that I love about living in Scotland! And we love a story set in Scotland starring creatures, flora and fauna that we recognise from our walks, journeys and local environment! 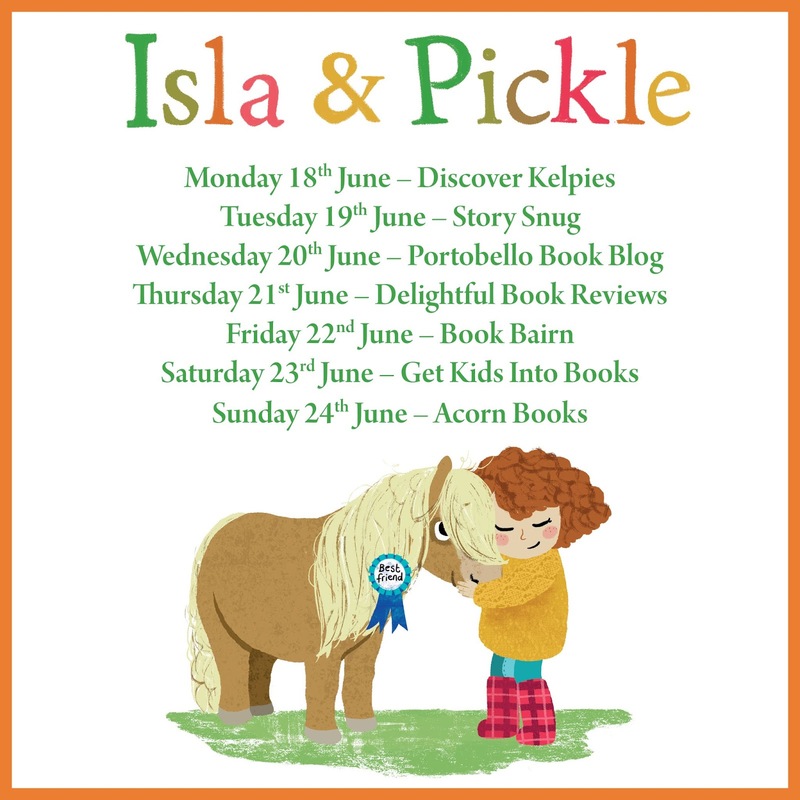 It won't surprise you that we are big fans of the Isla and Pickle stories that star a feisty wild ginger-haired little girl and her adorably naughty Shetland pony. This time they are off on an adventure to the Highland Games (which are held this weekend in Edinburgh though lots of local towns hold their own, including our little town!). We unfortunately missed the ones held locally due to other plans but we did make the Fife Show which is an annual event with similar animal competitions, though none of the caber tossing and athletic events. 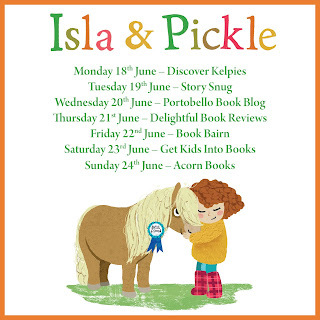 BookBairn thinks that in this story Isla and Pickle are off to the Fife Show because so much of the story is similar to the things we saw there so we talk about that as we read too - it's a great way for us to make text to real life connections! 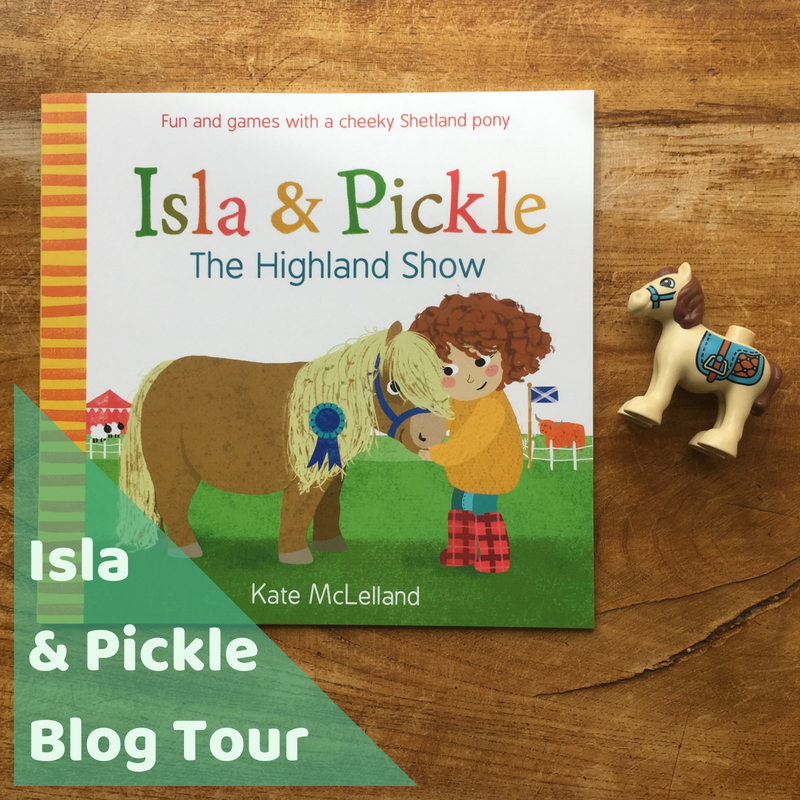 In 'Isla & Pickle: The Highland Show' by Kate McLelland, Isla can't wait to show off Pickle in the Perfect Pony Competition at the Highland Show. 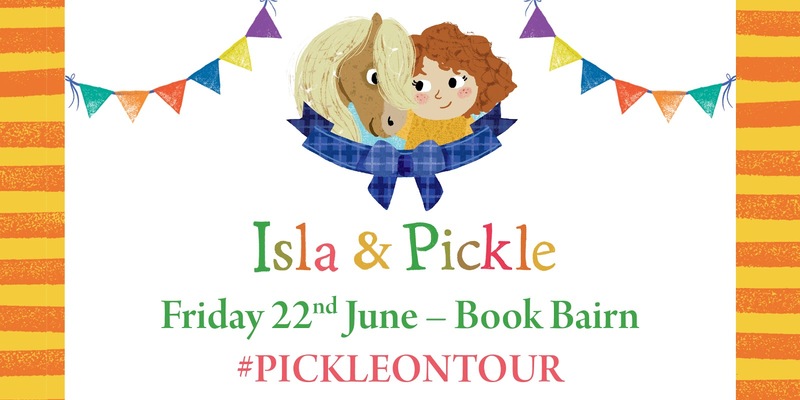 In Isla's eyes, Pickle is the perfect pony but when Isla sees her friend Rosie's pony, Belle, with her perfectly groomed coat and poise, she's not so sure that Pickle stands a chance. So they get into training and daily grooming but naughty Pickle just can't stay out of trouble! On the day of the show, he just can't stay away from the highland cows, and gets in an awful mess. There's no chance of him winning the Perfect Pony prize now. But maybe life isn't all about being perfect? Maybe there's a better prize? 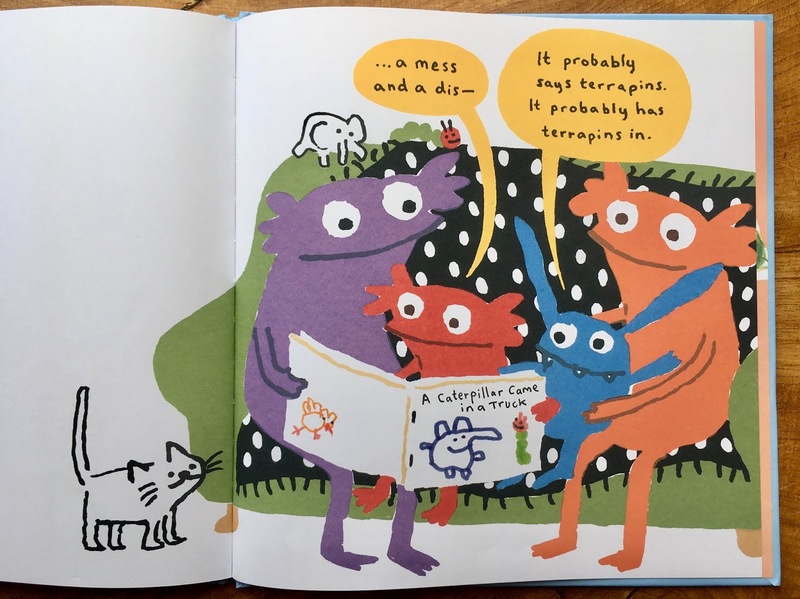 This is a delightful story about friendship and enjoying life - messy or not! The illustrations are delightful and packed full of humour and you are bound to fall in love with little Pickle and his loyal friend Isla. We love it! As part of our stop on the Isla and Pickle Blog Tour we got the opportunity to ask Kate McLelland, the author and illustrator of the story some questions! Isla is a lovely and fun little girl - is she inspired by someone you know? Pickle is based on my sister, Emma, but Isla was inspired by an idea, rather than a personality. Most children have a dream of wanting a best friend and they imagine what a brilliant friend they would be in return. Isla really represents that - the loyal and loving friend we all hope we are. In many of the stories we read to our children we find well-known and wonderful characters such as knights, princesses, witches, wizards and talking animals. These characters inhabit fantastical worlds where anything can happen. 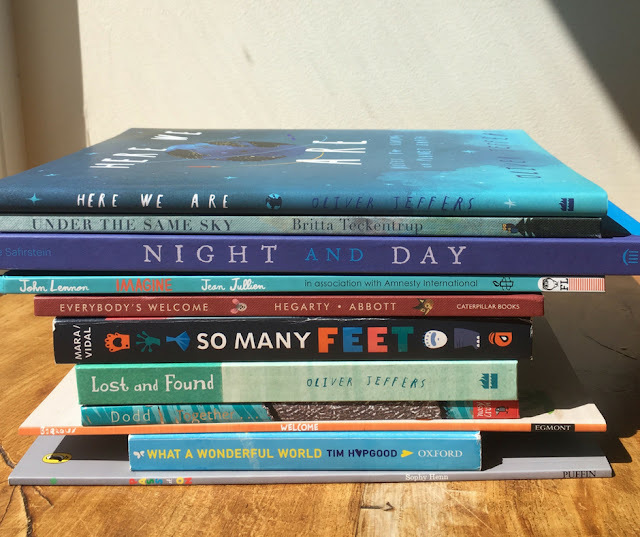 These stories are wonderful and inspire our children to dream. However, I have always wanted to create stories set in a more familiar world - that is still fantastical, bright and colourful. My children are Scottish and I hoped they would read my stories and think ‘this could actually happen to me, anything is possible!’. You also illustrated one of our favourite Scots books - There Was a Wee Lassie Who Swallowed a Midgie - what was you favourite Scots creature to draw? Although it’s not the easiest, my favourite is the Highland Cow. I have always loved them and have such fond and funny memories of picnics in Scotland amongst herds of cows! My favourite drawing in Wee Lassie is the one where the cow is sliding down the pole. On the blog we have we have a ‘Favourites Shelf’ feature of our favourite stories, which picture books would you have on your Favourites Shelf at the moment? We are big readers and I have a bit of an out-of-control book-buying habit and we visit our local library! So, our favourites shelf can move about a lot. Our current favourites include Big Baby by Jon Ward and Claudio Munoz. This was one from my childhood. Both my 5 and 3 year old love the Oi Frog! series, by Kes Gray and Jim Field. 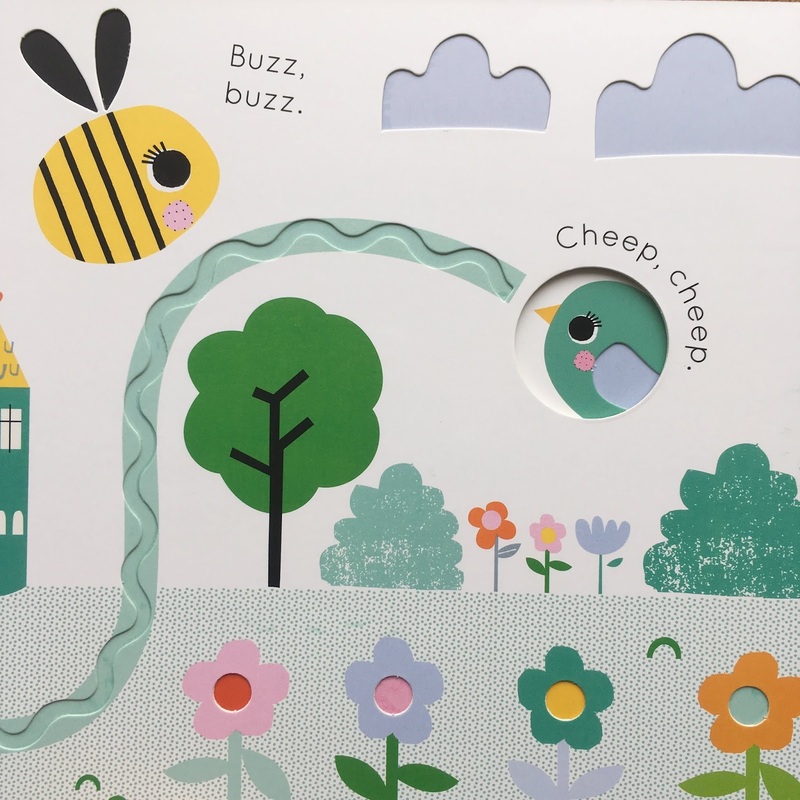 Quick Quack Quentin is by the same duo and it’s a brilliant way to get kids thinking about how words are formed as well as being fun to read. 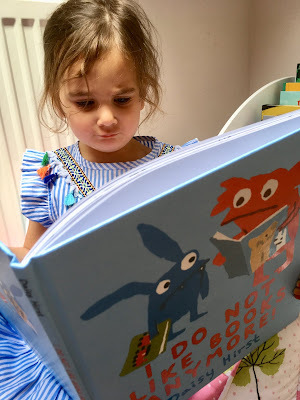 My daughter and I have just read Dogs Don’t Do Ballet and it’s both funny and lovely - Sara Ogilvie is an incredible artist! I’m sure there are illustrators who have inspired you, can you tell us a few that you like the most? Eric Carle is probably one of the first mixed-media illustrators children are introduced to. Nurseries love setting projects to recreate his way of making art and I think he was the first artists to inspire me. Beatrix Potter’s style is very different, watercolour and pencil were used to create the world of Peter Rabbit. I was inspired by Beatrix Potter and author illustrator Ruth Brown, as they both created detailed worlds that kept you looking at the picture long after you had finished reading the words. 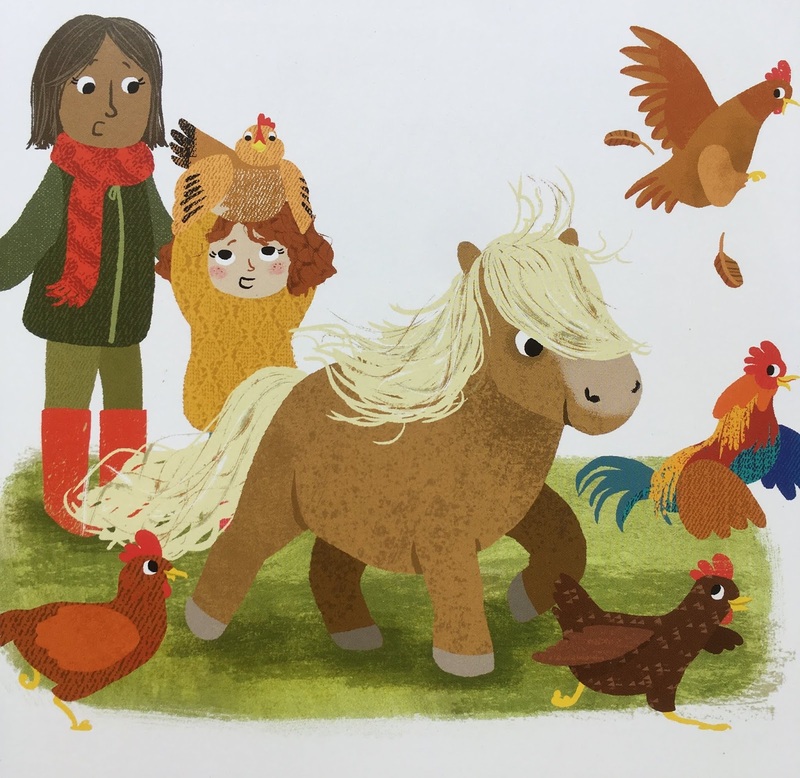 There are many illustrators working today that I admire, including Sara Ogilvie (mentioned above), Benji Davies, Jim Field and Helen Stephens. These illustrators work in a totally different way to me, but perhaps that is why I find them so inspiring. 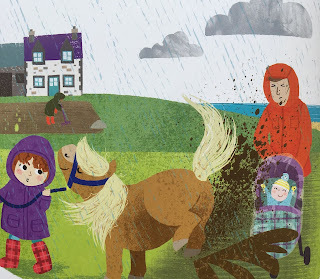 If you could choose any book or traditional Scottish story/rhyme to create new illustrations for, which would you choose? I would love to illustrate a scottish picture book version of Peter Pan, JM Barrie. My parents lived in a building where he wrote some of the novel, and it has always been a favourite of mine. I imagine neverland to be an idyllic scottish island, with tartan mermaids! 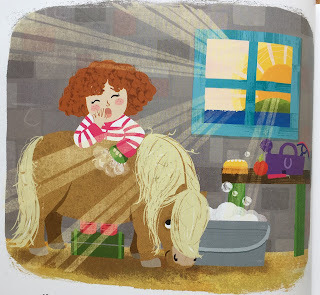 "I like Pickle - he is a funny pony. He likes to get messy. Does Isla have to brush him lots?" She tries to brush him every day, but Pickle doesn’t like his hair brushed because it gets tangled and sometimes it stings when the brush gets caught. "I saw horsies at the Fife Show. Was Pickle there?" He didn’t make it - but he will be at the Highland Show in a few weeks time and he’s VERY excited! Isla has promised him a treat. I like just about all the colours. My absolute favourites are blue/green, orange and yellow. When I was little, my favourite animal was a tiger. I adopted one and raised money for tiger charities. I drew tiger pictures and put them on my walls and I had a giant soft toy tiger, that was almost as big as me. Now that I am bigger, I like a lot of different animals - shetland ponies, highland cows, foxes, red squirrels and Narwhals are amazing! Have you seen one? They look like sea unicorns! Today I am drawing lots of different things that live in the sea, like crabs, fish, whales and even mermaids. Thank you so much Kate for answering our questions! 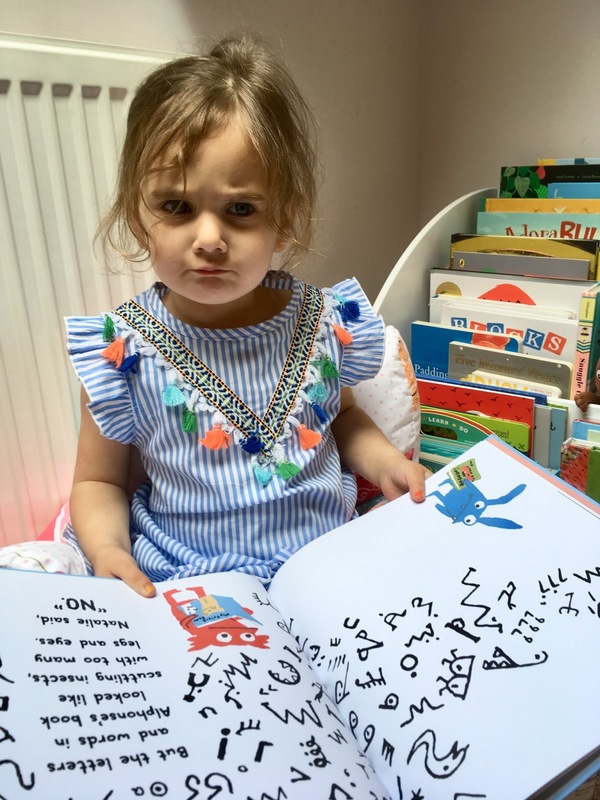 It was lovely to have you, Isla and Pickle on the blog! To check out more of the blog tour you can find all the details in the banner below! DISCLAIMER: We were sent this book for free as part of our participation in the blog tour. Words and opinions are as always our own. Have you ever heard children utter this dreaded phrase? 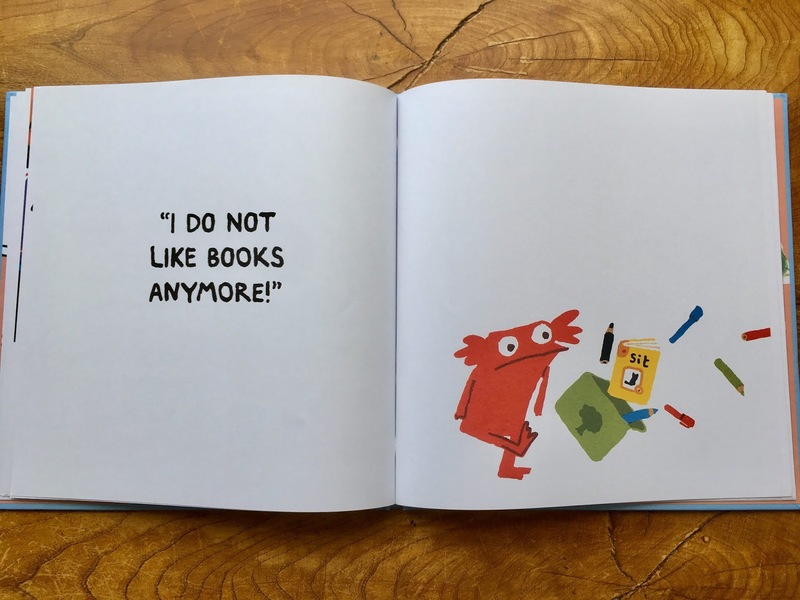 "I do not like books anymore." It would break my heart. And yet I completely understand that for children learning to read, trying to decipher and decode those squiggly lines and symbols can really take the fun out of storytime. As a teacher I’ve seen some of the joy sucked out of books and stories for kids as they try to learn to read. The letters look like squiggles and the decoding takes so long that fluency and understanding is lost. 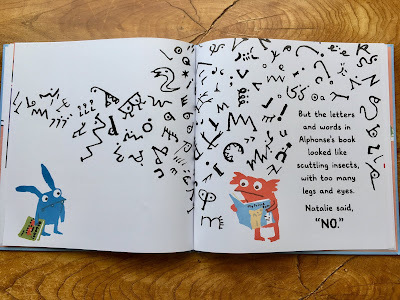 Imagine how it would feel to be presented with a wonderful image-packed picture book and all the words being in a foreign language, or worse in a language that is written using a whole different alphabet where the symbols mean nothing to you? That's often how children feel when they are learning to read. They can see the symbols are there but they don't know what they mean. Or they do know what sound the symbol represents but by the time they have processed that, blended it with the other letters to make a word, they have lost the whole context of the story making it a painful word by word process. But what they do know is that there is a story there, within their reach but they just can't grasp it! It can be an incredibly frustrating time and, for some children, it really can take away all the joy of storytime. 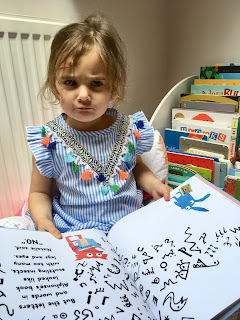 And that’s how Natalie, in "I Do Not Like Books Anymore" by Daisy Hirst, feels when she is learning to read. 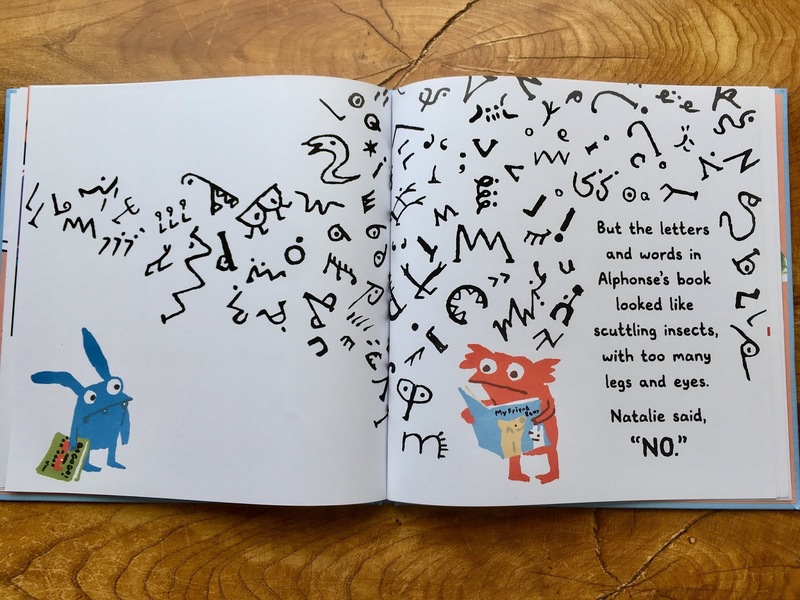 In the second title featuring these adorable monster siblings, Natalie and Alphonse, when Natalie tries to read all by herself for the first time, the letters look like squiggles, and she isn't so sure that she likes books anymore. 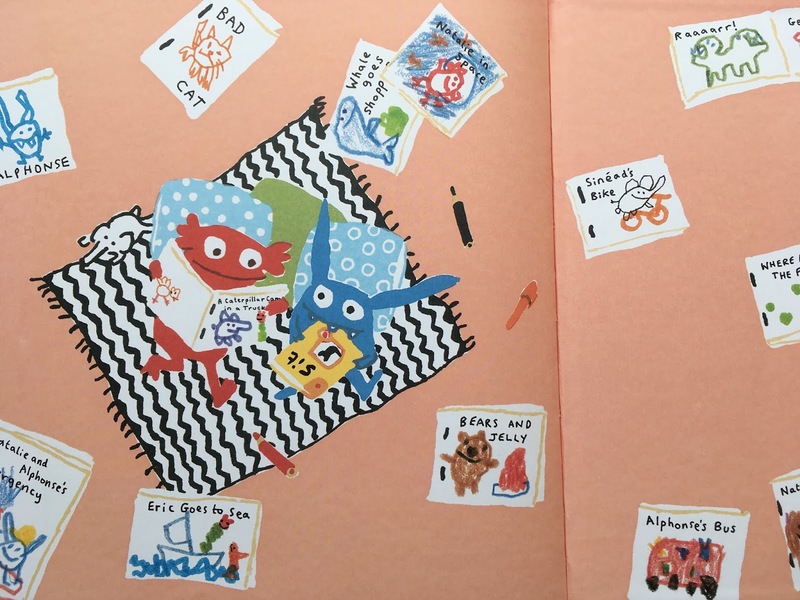 So Natalie instead tells stories to her brother and they make their own books packed full of their own illustrations and Dad helping to record their words. And when Alphonse asked for Natalie to tell him the story again, she finds that she can, mostly, read the book they have written. This is a book all about finding the joy in sharing stories, in feeling frustrated learning something new, and pride when you succeed. The illustrations are so fun! And the humour is spot on. This is a must have for all kids learning to read! As a teacher I love that you have approached the subject that learning to read can sometimes take the thrill away from reading. Is this something you have experienced yourself? Or have you seen it happen to children? Both! 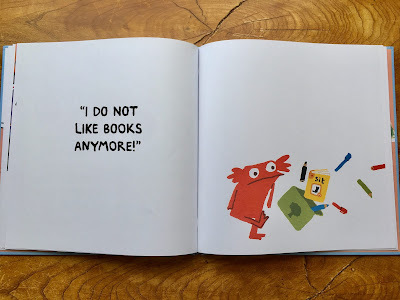 It took me ages to learn to read and I did NOT like it, even though I loved books and stories – in fact it was partly that the reading books seemed so much less interesting than the books my parents read to us at home. It wasn’t until year 3 that I first had the experience of realising I was really reading a picturebook on my own. I was also, briefly, a year 3 teaching assistant and I suppose it was quite a shock to suddenly see books (and words and the alphabet) from the perspective of a child who’s really struggling with reading and whose only contact with books may be with reading scheme books which aren’t very rewarding when they do manage to decipher them (although I do realise some schemes are much more interesting than others). 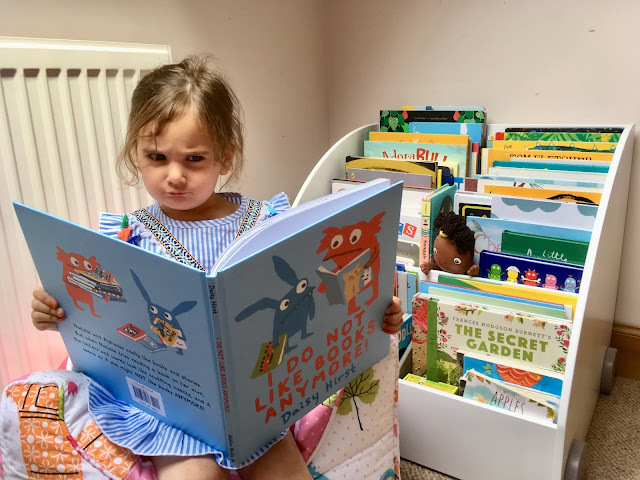 In BookBairn’s room we have a ‘Favourites Shelf’ of her favourite stories, which picture books would you have on your Favourites Shelf at the moment? Natalie’s favourite book (which Alphonse eats in Alphonse that is not ok to do!) 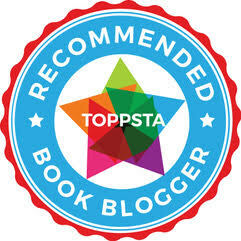 is A Bargain for Frances by Russell Hoban. I’m not sure about Alphonse’s favourite book – maybe it’s one of the ones he makes with Natalie? I’ve been drawing witches, a newt and bears. Thank you so much for taking the time to answer our questions Daisy! Make sure you still read aloud to them. Please don't let Biff, Chip and Kipper (or any other reading scheme) be the only books that they read. Help them to enjoy the magic of the stories. And by you reading aloud to them you are modelling good reading skills. Before you do any reading of the designated reading homework, get them to tell you the story. Look at the pictures and ask them what's happening. Don't even look at the words at first. They will likely have read the book in class so they may remember some of the details. This will help them remember what the story is about and they will be saying lots of the words that will come up in the text placing them at the front of their mind so that when they do start to slow down to decode words they will have a good idea of what words the story might contain. Try reading at a different time of day. When kids get home from school they are exhausted and probably not in a good mindset to try something tricky. I know mornings can be busy and stressful as everyone tries to get read to get out on time but reading over the breakfast table might be more successful. To all those little ones learning to read, you are getting the keys to a magical world of wonderful lands, characters and stories! Disclaimer: we were sent this book free for review purposes by the publisher after we requested a copy. Words and opinions are my own.